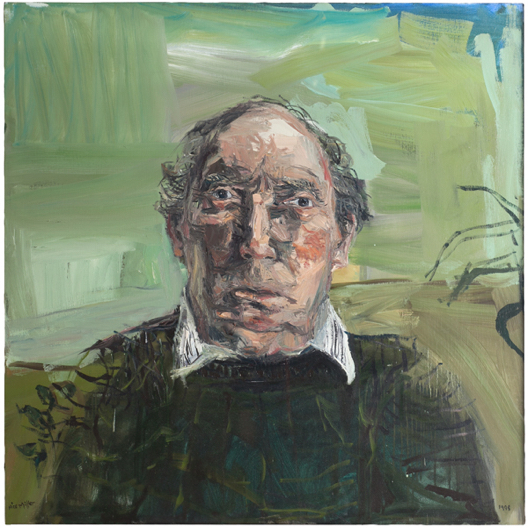 Nick Miller never knew whether John McGahern liked the portrait he painted of him, in 1998. Miller himself was unhappy with the first attempt but the writer graciously came back for a second week of sittings at the artist’s Kilmactranny, Co Sligo home. When the portrait was finished, McGahern walked out of the studio without so much as a peep at the finished product. When Miller told this story to the pupils from Gaelscoil Chnoc na Ré in Sligo town, they were fascinated by the writer’s lack of curiosity. The primary school is just one of 10 in the county chosen by Sligo’s Model arts centre for its groundbreaking Punc 1x1 outreach programme. Punc stands for Pop Up Niland Collection, the name of Sligo’s municipal art collection, which is based at the Model, and was put together through the dedication of former county librarian Nora Niland whose initial focus was on the work of Jack B Yeats. “It’s a great project because it brings the work out of the gallery and into the schools,” said Miller, one of 11 Niland Collection artists chosen for this pilot programme, which continues until summer 2017. Funded by the Community Foundation for Ireland, the pilot phase will benefit over 1,500 pupils and teachers, many in disadvantaged areas . The Model hopes that over the next five to seven years it will be rolled out to every primary school in the county. The other artists featured are Brian O’Doherty, Patrick Collins, Mainie Jellett, Eithne Jordan, Dorothy Cross, Sean McSweeney, Ronnie Hughes, Gerard Dillon, Arno Kramer, and Maeve de Markievicz , daughter of Constance. “Brian O’Doherty’s was the first piece chosen because he trained as a doctor and went back to painting in later life, and we wanted to let the children know that it is okay not to know what you want to do, and to change careers,” explained Imelda Ryan-Jones from the Model. Each school gets one art work at a time, which remains behind perspex – in case of accidents with footballs or flying school bags – for three weeks. “The whole idea is to break down barriers and get away from the notion of ‘high culture’,” said Glenn Gannon, acting principal at Carn National School in the village of Gurteen. In his former role working in the Model, he helped curator Jobst Graeves choose the art works for Punc 1x1. He says the response has been so positive that when a new painting arrives “it’s like Santa Claus has come”. When the McGahern portrait went to Gaelscoil Cnoc na Ré, Miller went along to tell the children about the experience of painting a writer he had much admired. Imelda Ryan-Jones has noticed a surge in families and schools visiting the Model thanks to “pester power” awakened by the Punc 1x1 project. When she visited the Gaelscoil a few weeks after Nick Miller’s visit, the children were still enthralled by insights such as the fact that the subjects were allowed to move as long as they wore the same clothes at each sitting. “He said he uses anything to paint with, like a nail, or his fingers – and he once used a power tool,” reported one 11-year-old girl.